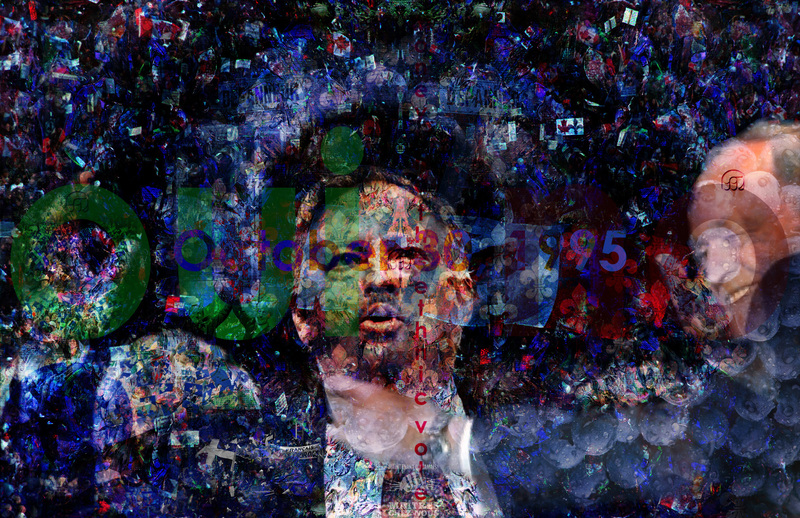 This particular customized multi-sensory composition was inspired by the release of Jacques Parizeau’s never-released acceptance speech for the possible success of the Quebec 1995 referendum. Listening to it for the first time was both fascinating & a truly emotionally charged moment. I chose to take a slightly satirical view to dull some of the haunting feelings/thoughts that fill me when I think back Fall, 1995. The music was initially created with a particular emphasis on specific elements of this speech. The world’s best tasting blueberries comes from the Saguenay–Lac-Saint-Jean region of Quebec & Canada is the world’s largest producer and exporter of wild blueberries, with 200 million pounds of the fruit, 80 million of which come from the Saguenay–Lac-Saint-Jean region of Quebec. This fact combined with the fact that Quebecs are often referred to as “les bleuets”. The artwork is composed of a multi-layer collage that attempts to recreate some of the emotions that were felt during this period of time. From a personal point-of-view, this project expresses emotion, but it can be considered slightly satirical. Novotaste’s Natural Blueberry Flavour (Lac St-Jean Type), F11979 was initially created for beverage applications. For this particular CMSC, it can be diffused or sampled in carbonated water while listening to the music & viewing the visual art. 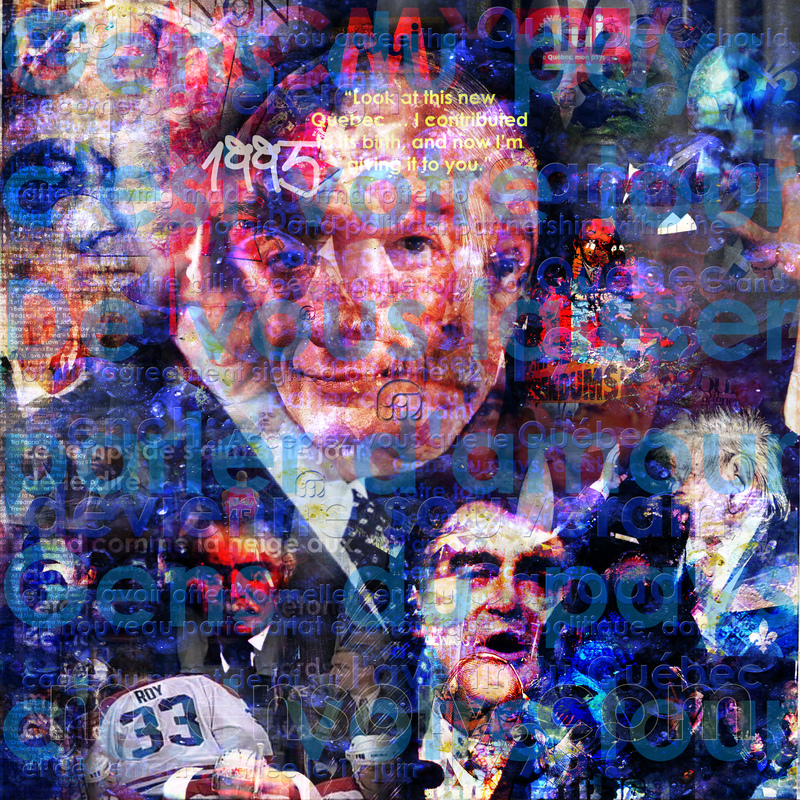 Original artwork is 60″ x 60″ with over 200 layers. The music was the starting point for this project. The initial set of sounds & sequences were built around some key parts of Jacque Parizeau’s freshly released acceptance speech that was obviously never aired. Now, look. Now, I seen the woman; my sense of sight said she was there. Then I knew she was there by the sense of sight. I closed my eyes; I didn’t have sight. Then I felt her, and the sense of feeling said she was there. The sense of feeling was just as direct as the sense of sight, because it was a direct evidence. Now, faith is a direct evidence of things not seen, felt, taste, smelled, or heard. Now, look here. I’m going to close my eyes now.